Things removes friction in magical ways. 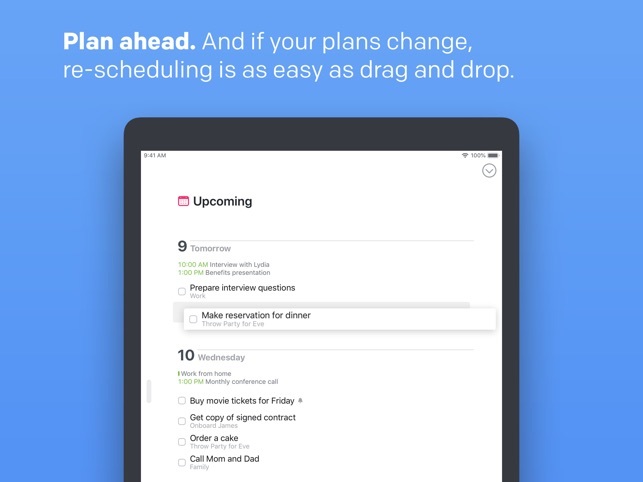 Take the new Magic Plus Button that lets you insert to-dos at any place in a list – simply via drag and drop. Or the ease at which you can multi-select and operate on many to-dos at once. Or the natural language date parser: just type “tomorrow”, “in 4 days” or “next Wednesday” and it will jump to all the right conclusions. 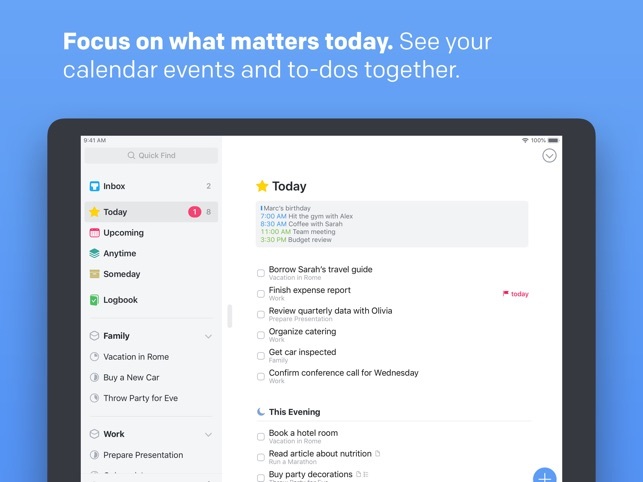 Things is fully integrated with all the latest iOS technologies: Calendars, Siri & Reminders, Today Widget, Slide Over, Split View, Action Extension, Handoff, and Notifications. Get Things for Mac, iPhone, and Apple Watch to enjoy the full power of Things across your devices (sold separately). The apps all stay updated via Things Cloud – the push sync service that we custom-built for Things. • Fixed a bug that miscalculated the date for a repeating to-do’s next instance if the repeating pattern was created on iOS and was set for the last day of the month or year. Everyone needs a task manager—and Things is adaptable enough for anyone. This Apple Design Award winner is crisp and lightweight, featuring a simple but effective interface. 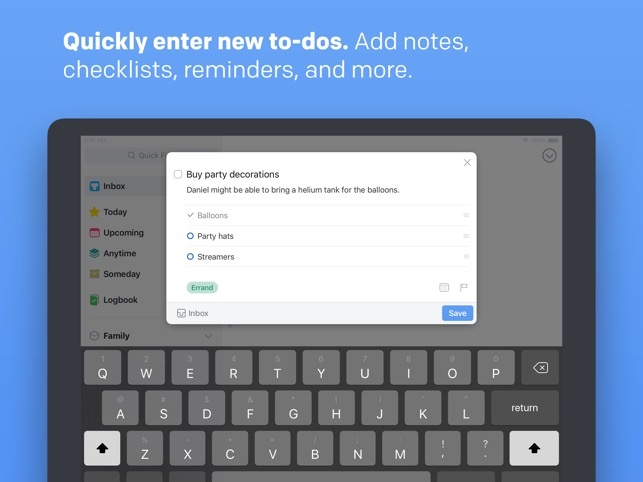 The ever-present Magic Plus button makes it easy to add to-do’s from anywhere in the app, and organizing items is as simple as dragging them where you want them. 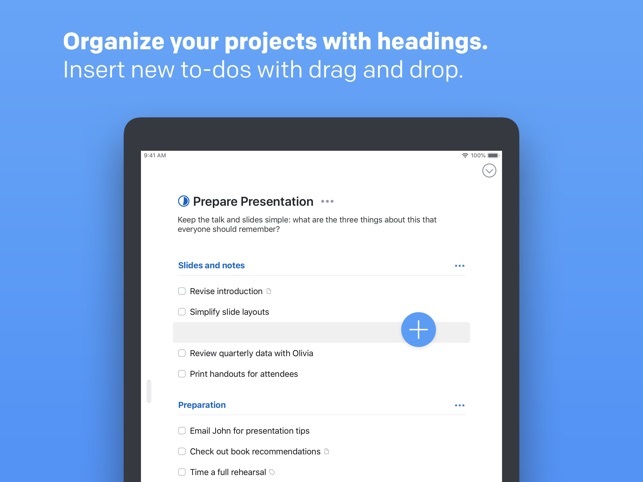 It’s like the unicorn of productivity tools: deep enough for serious work, surprisingly easy to use, and gorgeous enough to enjoy staring at. A little history on myself. I have been away from GTD apps for quite a while. The last app I used and paid for was Omni Focus and fell out of favor with that app due to its complexity. I never could buy in to its way of organization. I had tried things at that time (still in version 1 I believe) and the app just did not work the way that I wanted it to. Now comes present time. I finally grew tired of the limitations of the stock reminders app and did some extensive research on a few of them. Read many blogs on strengths and weakness of all of them. I think when it comes down to all GTD apps there really is no best app. So do your own research. What I love about this app is its powerful simplicity. 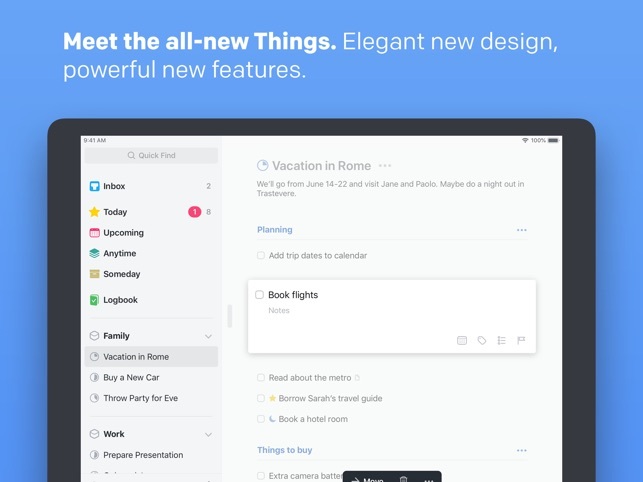 I never realized how much more organization things 3 brought to the table but yet look so clean. Is it perfect, no but neither is any other app. Things 3 can certainly use some upgrades. Alexa integration would be on the top of my list. Apple’s Siri speaker when it comes out is still not feasible given the price. One of the other simpler changes is eliminating the three dots for more options at the bottom of the todo list. iPad has plenty of screen real estate to show all the options without the additional button press. 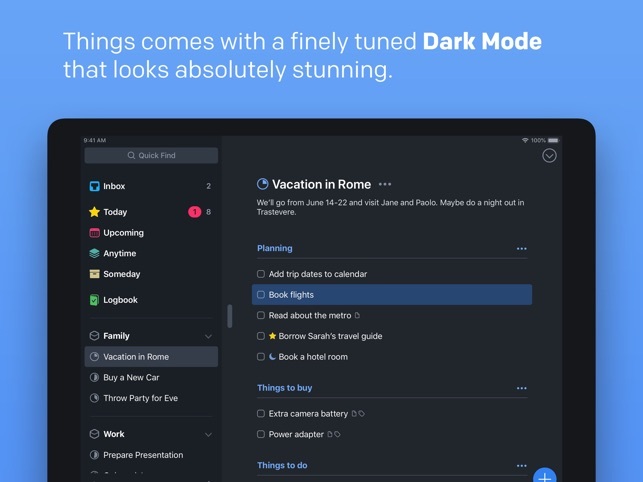 Things 3 is well written app that works as it should. I have not come across any annoyances just yet but I am only a fews days in to the app but enjoying it very much. I am kinda mad that I did not buy it earlier. After trying several todo apps over the years, I finally broke down and bought Things 3. I am kinda mad that I did not do it earlier. I have used many todo apps over the years but have always ended up with unusable clutter. Separating my lists by app for work and personal did not help much either since that meant having that many more apps on my phone. Each just ended up in a folders like Productivity and Work apps which meant 2 taps to get to an app to see what needed to be done next. Since they did not integrate my calendar I had to check both the todo apps and calendar to see what was going on on a given day. In short, that doesn’t work and I still had the challenge of balancing my home and work responsibilities with just my brain. That is needlessly stressful and every few months I would look for yet another way to solve the problem. I balked at spending even more money on yet another todo app but I had heard good things about Things for years so I finally took the plunge on the iPhone. I transferred all my lists from other apps and deleted them so that Things 3 would have a prominent place on my home screen. Several months in and I love it! One place to see everything including my color coded calendars and now I own it on iPad and Mac! Less stress, so happy! Requires iOS 10.2 or later. Compatible with iPad.